Hebron Townhomes, either demolished or under private ownership presently. This suburb is one of the newer suburbs in Chicago land history as it sat as a barren Lake County land all throughout the 19th century. It was not until the autumn of 1899 that this land was actually considered for suburbanization by John Alexander Dowie (pictured right) who immediately went to work purchasing and making major plans to develop the land and set up an entire town that he would call “Zion City.” He took the name after his “Christian Catholic Church in Zion” (pictured below) that he organized in 1896 that was a church based upon apostolic principles. 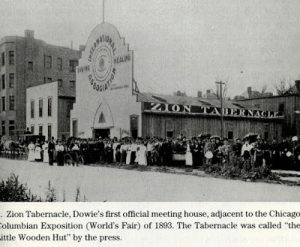 Dowie wanted to create a society that was free of sin and the evils of society, thus, creating a highly religious community where he would offer residents leased land and employment which Dowie would control in order to weed out any undesirables. Dowie forbade alcohol, gambling, swearing, dancing, spitting and what is funny he banned politicians. He even banned stupid things like oysters, doctors and even tan colored shoes. Doctors were banned because Dowie believed in faith healing. He would keep the town leased until approximately the year 3000 which is 1,100 years from the year 1900 because he thought Christ’s return was to come around the year 2000 then add 1,000 years after that more for a millennium afterward. Ground broke for construction in 1901 as the first house was built and shortly after the town was doing excellent and Bowie’s dream was taking off successfully. 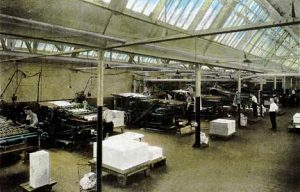 The Zion Department Store and Zion Lace Industries (pictured above) employed 3,000 workers from the town. 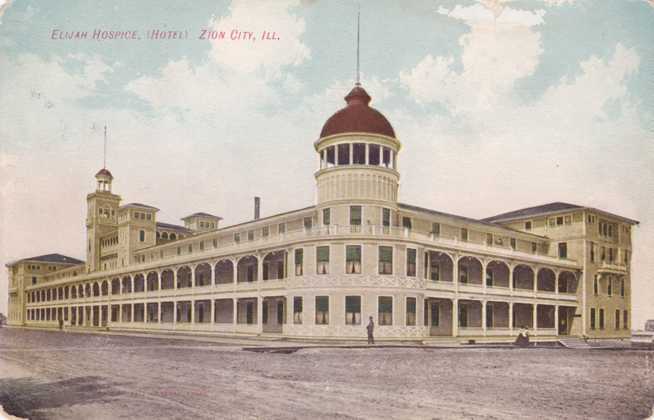 Bowie brought more industries such as: Zion Cookie Factory, Zion Hospice (pictured above), Zion Candy Factory, a lumbering mill, an electric plant, a brick kiln factory and a Zion Hotel. Despite all this success on the outside the city was actually suffering financially, Dowie’s plan was both successful and unsuccessful. In September, 1905 Bowie suffered a severe stroke and sent himself away to Jamaica to recover as he left Wilbur Voliva (pictured right) to be the power of attorney and run the city during Dowie’s absence. 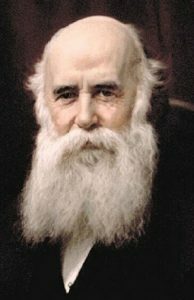 Once Voliva took over he saw how bad the financials were and tried to convince Dowie to release power over the city but Dowie refused and the two men battled in court until Dowie passed away in March of 1907. 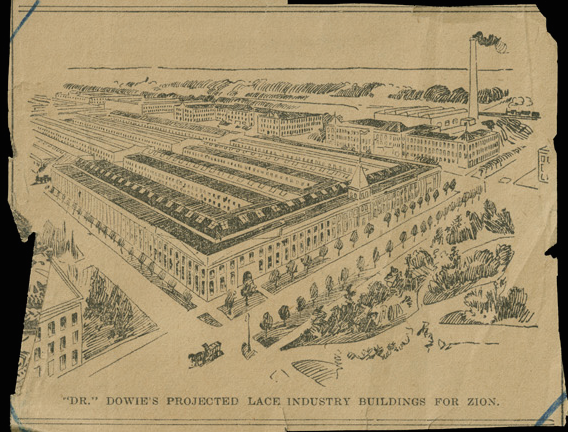 After Dowie’s death Voliva vowed to get rid of the church controlled industries in the community, Voliva quoted in a 1907 article to the Chicago Tribune “I wish we could sell the lace factory and printing house, if I could sell them tomorrow, I would be a much happier man. I would rather have a real life business man than Zion City drones running those factories.” (Chicago Tribune page 6 April 15, 1907). This may have been what led to the end of the oldest industries in the community, because these industries did not last long, it appears Voliva got a part of his wish accept outside businesses did not become interested in the town until the later 20th century. There really was not much else interesting about Zion’s history as it sat as a community with no industry for many years and remained a smaller town with just a few thousand people. The lack of industry in the community and the fact that the town was too far from Milwaukee and Chicago for an easy commute made housing cheap in the community which became ideal for those that were able to commute to other nearby Lake County towns for work or were willing to commute to Chicago or Milwaukee which were each about 50 miles away from the town. The cheaper homes were very appealing to lower income families that could not afford homes in the suburbs that were closer to industry; therefore, many working class and low income class families found the suburb suitable and this included many lower income African American families that began moving into the suburb more by the 1950s. As the early 1960s rolled in, plans were put in motion to build public housing townhomes along Hebron avenue in Zion City which would house low income white, black and Hispanic residents. On one side of Hebron the white residents would have the townhomes while the other side was to be occupied by black and Hispanic residents. The townhomes were built in the year 1964 along with several houses that surrounded the public housing project. The first issues in the Hebron Housing projects was racial strife as each side of Hebron Street became territorial based upon racial boundaries (Chicago Tribune Gary Mays August 26, 1996). In the 1970s white residents continued to move out of the housing project as the decade progressed until the projects were left to Latino and black families by the end of the decade. The housing project experienced white flight in the late 1970s and early 1980s mainly because many severely impoverished black and Latino families settled into the projects because of the loss of the many industries in and around Chicago devastated many families where the bread winner worked in any of the unskilled labor professions that became obsolete by 1980. As desperate families moved in, many of their teenage children were members of Chicago street gangs such as: Black P Stones, Conservative Vice Lords, Black Gangsters (Now known as New Breeds) and Black Gangster Disciples. The gangs became visibly active in about the year 1980 in these projects as some older gang members were even moving into the public housing project. In the early 1980s, crime suddenly increased in the village to much higher numbers than ever seen before, gang activity and shootings was also a new thing for the village of Zion City to deal with and many residents were growing concerned. As the 1980s progressed, drug trafficking, shootings and heavy gang activity grew larger and more gangs moved into the public housing project and all over the east side of town. More African American gangs moved into the village such as, Four Corner Hustlers, Black Disciples and Unknown Vice Lords. Latino street gangs from Chicago also moved into the village and the projects such as: Latin Kings, Maniac Latin Disciples, Latin Lovers and Imperial Gangsters. In the year 1982, the projects at 27th and Hebron were sold to a private developer that fixed the projects up, as a result gang and criminal activity was much lower than the other town homes (Chicago Tribune Mary Hill March 29, 1993). The fact that these town homes are isolated from the rest of Hebron also contributed to lower crime in this complex. What started off as some concerning gang activity, some shootings, some graffiti and some drug trafficking in the early and mid-1980s exploded into a major storm of heavy gang activity in the late 1980s on the village’s east side especially in the blighted Hebron housing projects that became full of gang activity and street fights along Hebron Avenue. Hebron Avenue now became a dangerous place by the late 1980s especially as the crack cocaine epidemic swept the nation, law abiding residents living in and near the projects began living in fear. In the year 1988, a drug related double murder case shocked the city and caused terror in residents of Zion. The Black Gangsters had of course migrated and settled into the suburb in the 1980s and were known as “The Royal Family” which are now known today as the New Breeds street gang. The Zion chapter of the Black Gangsters was led by Daniel Blalock Senior, according to court documents. Theodore Knox, a young member of the Royal Family/Black Gangsters came across two Mexican males on February 17, 1988 that were trying to sell 2 pounds of marijuana to Knox’s leader Blalock Sr., according to court documents. Apparently the Royal family members planned to take the marijuana without paying for it but supposedly no one was supposed to get hurt and that is what happened, the gang members took the marijuana bag out of the two men’s hands and left the scene. Later on at the 2210 Hebron project building the two men that had the marijuana stolen from them returned to the project to demand their money back and entered the laundry room and confronted Theodore Knox in there. 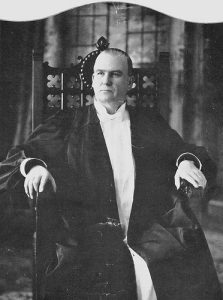 There are conflicting stories presented in this case but the main one that was accepted by the courts was that Theodore Knox shot and killed one of the men by putting a bullet is his head. The shots were heard by fellow gang member Ronald Walker who came into the laundry room where Knox was struggling with the other man, Walker picked up the gun that the slain victim had dropped and shot the other man several times in the back of the head until the .22 pistol was empty. Theodore Knox was convicted of the murder and sentenced to life in prison which is where he still remains; Blalock Sr. was also convicted but may have passed away by now (People vs. Knox, 1993). In this court case there was a part where Ronald Walker testified that when he first heard gun shots he ignored them because gun shots were commonly heard in that building which goes to show that these projects were flooded with drug related gang violence by 1988. The projects also began to deteriorate in the 1980s causing residents to live in substandard conditions because landlords no longer bothered to make renovations and repairs. Not only was Hebron Street a site of heavy gang activity and drug trafficking in the village, there was also really heavy crime, gang and drug trafficking on the south east side of the community as several street gangs battled for those street corners. The entire area bounded by Ravine Drive to 17th Street on the north, 33rd Street on the south, Sheridan Road on the east and Lewis Avenue on the west became the area of town where heavy crime, drug and gang activity occurred in the past and is still presently the rougher part of town, Shiloh Park is in the center of the crime hot spot part of town and has been referenced by many as the tough area and everything around it. By the early 1990s Hebron Street was so full of gang activity and noise that residents could not even sit outside anymore because of the excessively loud music that was so loud one resident described that her pictures would fall off the wall because of how loud it was in her interview with the Chicago Tribune in 1993 (Chicago Tribune Mary Hill March 29, 1993). There were gang fights in the projects and in the streets and the area was completely covered in graffiti and litter. Residents could see around the clock drug dealing and hear gunshots so often that they did not bat an eyelash, the nickname for Hebron Street by the projects was known as “Murderville.” On one night of 1992 over 200 people were hanging out on Hebron Street and as police attempted to break up the crowd of rowdy people, they were greeted with gun fire and police needed to leave quickly, this was a show of power by the gangs in the projects (Chicago Tribune Gary Mays August 26, 1996). On January 4, 1993, the city council officially declared the projects between 21st and 24th Street a blighted area and was going to look into condemning the properties or renovating the 34 buildings because these were now considered slums (Chicago Tribune Mary Hill March 29, 1993). 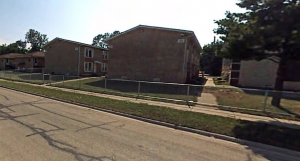 The slumlord running the projects at 24th and Hebron was Walter Sheets who gave the city a hard time with negotiations to purchase the townhomes by 24th and Hebron which were in the worst condition of all the other projects. These projects were the noisiest and most graffiti covered buildings in the Hebron area (Chicago Tribune Caron Smith December 22, 1993). 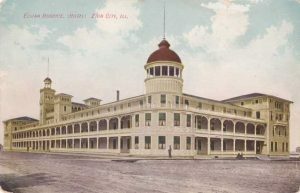 Eventually the city was able to purchase the project buildings but found that the buildings were too far gone and rotten to fix them up and demolition needed to be considered. In the year 1993, the crime problem was still a major issue and growing issue on Hebron Street and the surrounding community. The city was working all year long trying to figure out which townhomes were to be demolished and which ones were to be fixed. In the meantime drug trafficking was still out of control in the complex and police officers being camped on Hebron Street night and day was not enough to deal with the heavy crime in the area, so police began using bicycles as these were better for mobility going through the projects’ alleyways, glide between buildings and quietly sneak up on drug dealers before they had a chance to run or ditch their stash, this lead to 178 arrests in the village in 1993 just from the bicycles especially in the projects by 24th and Hebron (Chicago Tribune Lou Carlozo July 7, 1994). The bicycle patrols helped in the mid-1990s but drug trafficking, crime and gang activity was still a major factor on Hebron Street and the surrounding area. In 1996, the city had finally purchased all the Hebron project townhomes and went about looking into renovations for the townhouses at 21st and 22nd and Hebron. The city condemned the projects at 24th and Hebron in 1994 after they finally negotiated with Walter Sheets, and slated them for demolition by the summer of 1996. Most residents of Zion were happy to see these buildings come down because they were so deteriorated and crime ridden that they became a tax drain due to needing a constant heavy police presence in that area, even the Zion police were more than happy to see these come down as these were the cause of 24 hour surveillance on this street. Residents voted for the demolition and rebuilding of new condos in place of the projects which would result in a voluntary tax increase; however, it was a small price to pay for many of the residents wanting these slum buildings gone. Residents within the complex had mixed feelings, many were worried about where they would live next (Chicago Tribune Gary Mays August 26, 1996). The buildings may have been torn down but no new structures have ever been built, another public housing promise that was never fulfilled. Zion is still a rougher suburb, mainly on the cities’ east side and southeast side. There is still heavier gang activity in this community and there is at least one documented homicide every year. Zion is an inexpensive place to live but a lot of that reason is because it is a rougher suburb. The Hebron Street area has much lower crime than it used to have ever since the 24th and Hebron buildings were torn down and the other Hebron buildings were renovated, the area just west of Shiloh Park has now become the biggest crime hot spot in town. The area just south of Shiloh Park has improved over the years but still has issues with crime. Zion has had the following gangs over the years: Black P Stones, Imperial Gangsters, Insane Majestics, Latin Lovers, Black Disciples, Unknown Vice Lords, Latin Kings, Gangster Disciples, Maniac Latin Disciples, Conservative Vice Lords, Four Corner Hustlers, New Breeds and City Knights.